On the inside of yet another Thames bend, facing Thamesmead West, the housing developers arrived early. They threw up gates around their enclave, and coveted their riverside promenade, and are I suspect seriously miffed that the Thames Path runs along it so they had to include a pushbutton system to allow the public through. Despite this being Gallions Point on Gallions Reach, all policy directives are countersigned by a body called Galleons Point Management Limited, and they have prohibition signs slapped all over. On my incursion I discover every bench on the promenade is empty, perhaps because when seated the entire river disappears behind a concrete wall. An over-optimistic number of litter bins has been provided. At the point I'm looking for, steps lead up and over the concrete wall to a wooden gate, where a sign informs me I'm about to enter the Galleons Point Riverside Wildlife Area. This is a rarity in inner-ish London, free access to the tidal foreshore down a steep scrubby slope. The only wildlife is a pair of swans wading where the muddy beach turns to water, and occasionally flapping their wings because they can. I could jump down and walk on the bed of the Thames, or more sensibly follow a sliver of grassy path below the river defence not terribly far round the next bend. Instead I clamber back onto the promenade, surprising a kagouled couple walking through, one with her thumb in a copy of the Capital Ring guidebook. They're so nearly finished. Royal Victoria Gardens glows with civic benevolence, imbued in the days when dock workers needed somewhere to recreate. Today its playgrounds are its best feature, but football tricky because there's only one goal. A faded sign outside the bowls club suggests a cup of coffee costs only 80p, a beef burger £1.50 and a single slice of toast 10p (chocolate spread 20p extra). 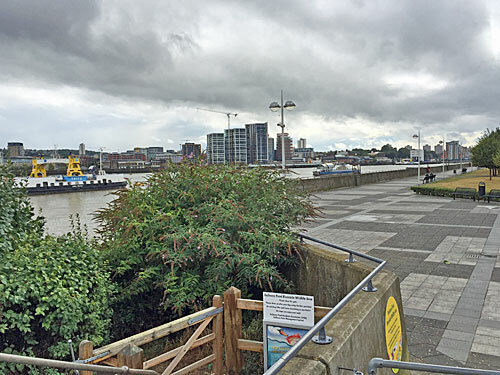 Originally this park was in Essex, but peculiarly the two pockets of land immediately to either side were administered by Kent, because Woolwich's boundaries have long been archaically obtuse. My westward odyssey scores a direct hit on the crossroads at the very heart of North Woolwich, where Pier Road breaks off from Albert Road, at what was once the end of the North Circular. Traffic continues to feed down to the ferry terminal, and gushes back out in regular waves. 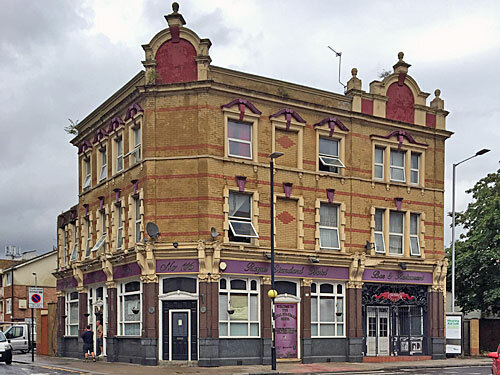 On one corner is North Woolwich Police Station (brick, 1904), while opposite is the Royal Standard Hotel, purveyor of (cough) gentlemen's entertainment. It's too early in the day for live on-stage action, so the clientele can be seen heaving their t-shirted paunches over the pool table, feeding the fruit machines and occasionally stepping outside for a smoke. A young lad hurries over the zebra crossing towards TJ's Kebabs, cursing the parental errand that will see him entirely drenched by approaching stormclouds before he gets his box of chicken home. The next mile of 51½°N is inaccessible because it passes through grubby industrial estates and Europe's largest sugar refinery. Once all this was chemical works, jam factories, mills and wharves, as river frontage and proximity to the Royal Docks made Silvertown bustle. 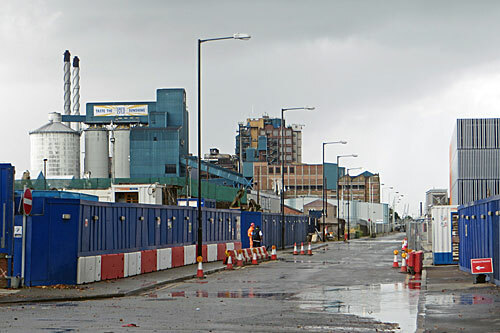 Today Factory Road is easily one of London's most desolate streets, trapped behind Crossrail's uncrossable tracks, and will thankfully be shielded from passengers by an unbroken concrete wall. What they will see if they look up are the silos and chimneys of the Tate & Lyle refinery, which have been "keeping the nation sweet for 140 years" according to the banner strung on high. The original owner was Henry Tate, not Abram Lyle... we'll be narrowly missing his golden syrup works further along at Plaistow Wharf. 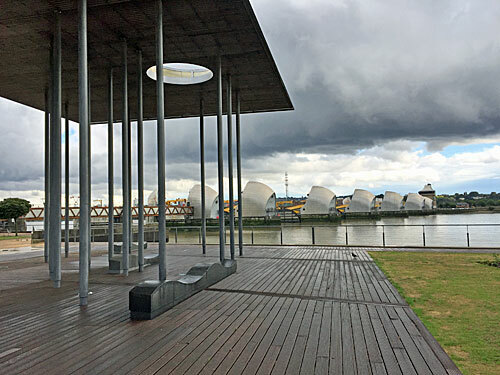 51½°N doesn't quite skim the Thames Barrier, but it does hit the attractive modern park on its upstream flank. Opened well ahead of the curve in 2000, its reclaimed acreage has done much to boost house prices in these parts - so much so that its former car park is currently being converted into 236 flats. The sunken rippling Green Dock is its finest feature, but I'm heading to the flat-topped Pavilion of Remembrance closer to the river. Finally repaired, and devoid of scaffolding, its undulating stones pay tribute to unnamed local victims of war. I'm up on the marble-edged lawns, trying to get a decent photo, when I slip and start to fall. It recently utterly tipped it down, and although I did read the sign which says "decking slippery when wet", I stupidly forgot to transfer that warning to the stones laid around the edge. Initially there's a moment when I think I might be able to regain my balance, but after a split second additional momentum kicks in and I resign myself to a flying splat. I wonder how much it's going to hurt. I should never have worn these old trainers, the tread's too worn. But somehow I tug myself out of it, a cramping muscle in my left arm the only injury, and steady myself on the ground in blessed relief. One day, I remind myself, a similarly careless slip could have more far-reaching consequences. 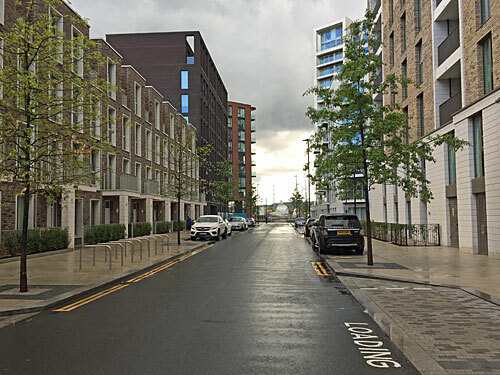 Nobody wants industry any more, they want homes, so an enormous area of Thames frontage has been cleansed and Ballymore are creating Royal Wharf in its place. They're keen to give it gravitas, claiming they're creating a district with "unmistakeable character" like Belgravia or Bloomsbury, whereas the reality is brick vernacular apartments and townhouses squished along a warren of streets, the vast majority with no river view at all. Estate agents scuttle along the streets in golf buggies, private security guards in something dinkier, and colourful hoardings represent vibrant businesses which might be moving in on the ground floor but haven't yet. Starbucks is doing well, and Sainsbury's has a captive audience, but the only other sign of retail life I could find was a planning notice for an unopened nail bar requesting an 7-days-a-week alcohol licence. Nothing else along my 31 mile journey will nod at London's future more clearly than Royal Wharf. I like Lyle Park, mainly because whenever I visit I always assume nobody else knows it's here. That's doubly the case on this occasion, because the sole entrance to the park has been swamped by a puddle, and I have to teeter round a dog mess bin and brush along a soaking privet hedge to gain access. I am correct, there is absolutely nobody else present, the football pitch awaiting matches that never come, and the riverfront benches devoid of even a scattering of litter. And yet the park is evidently well looked after, the shrubbery vibrant, the changing rooms primed, and developers held firmly at bay. 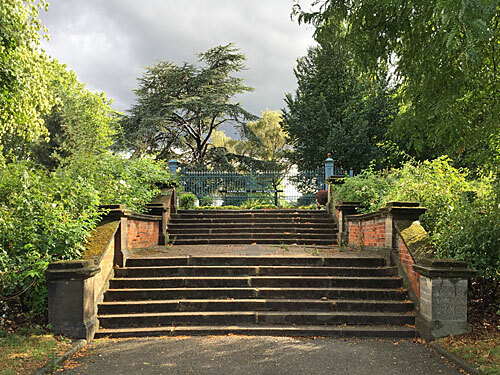 The park was gifted to the people of West Ham by Abram Lyle's syrup dynasty, essentially to give their workers a thin sliver of recreational land and a smidgeon of river access. The focus of the raised gardens at the rear used to be a bandstand, but the former factory gates of the Harland & Wolff shipyard now provide the centrepiece, relocated from North Woolwich when the business folded. I could sit happily up here staring at the ugliest bit of Greenwich, and the river traffic floating through, were it not for the nagging feeling that I'd be a sitting duck for petty crime. The park's single entrance is so far distant, and the adjacent businesses so bleak, that... well, just don't visit the park alone if your imagination thrives on worst case scenarios.